If you've followed along in my printing series, you know that I'm a fan of Red River Paper as a suitable alternative to more expensive papers. 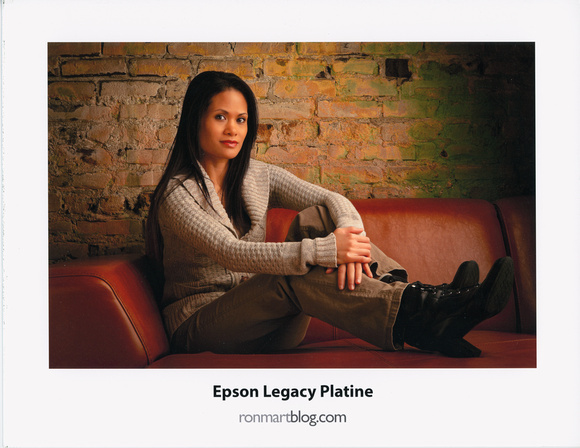 In fact, my article entitled Red River Paper vs Epson Papers has been one of my more popular articles because I offer my honest opinion on similarities and trade offs for going with Red River over various Epson papers. 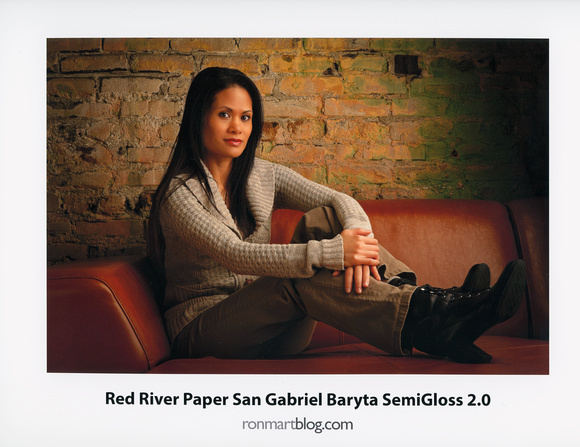 With that disclaimer out of the way, I have to state up front that San Gabriel Baryta Semi Gloss 2.0 is the best Red River Paper that I've ever tested. The colors and blacks just wow you just as much as the best Baryta's on the market that I've had the pleasure to use and/or examine in real life. Now I've said a hundred times, but I'll say it again - if you want to make a print look terrible, try to scan or make a photo of it. No matter how good the scanner or the print, NOTHING beats seeing a print in real life. With that disclaimer out of the way, to best illustrate the differences/similarities of two papers, I scan them in using my Epson v850 scanner using identical software and setting so you can at least get an apples to apples comparison. It should be noted here though that the San Gabriel Baryta Semi Gloss 2.0 images may be slightly skewed due to them being printed on 11x14" paper and my scanner not being able to accommodate that size. This has a mild impact on edge brightness and sharpness since the edges aren't as flat against the bed as the letter size Epson prints. However, they are close enough for casual viewing distance comparisons. Click the images below to see a full-size TIF scan of the paper. All images are copyright Ron Martinsen - ALL RIGHTS RESERVED. You may view them while this article is open in your browser, but you may not print, edit, save, distribute, etc... them without signed written consent. 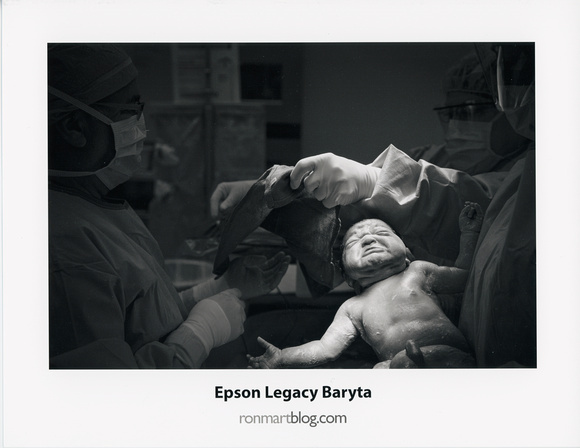 These prints are both doing the ABW Dark, Warm setting which you can see the print settings / tutorial in video form in my Legacy Baryta review. In real life the print was identical in temperature. Since no ICC profile comes into play, these were basically two identical prints. Even using separate ICC profiles, these prints felt almost identical. There were a couple spots where I wondered if one was better than the other, but then I realized my eyes were probably playing tricks on me as they were both excellent prints. Again, phenomenal results for both that made me again say this was close enough that no mere mortal is going to ever know the difference. In the hand the Platine as a little more flex and surface texture that attracts light, but color wise both are delicious! Pigment Ink Users: This media requires Photo Black inks. You won't have any problems picking out the San Gabriel Baryta Semi Gloss 2.0 versus the competition because it feels sticky / ready to print on both sides. This is probably my biggest negative I can say about this paper. Beyond that, this paper has a little less flex and visible texture than the Epson paper, but none of these are issues for framed prints. 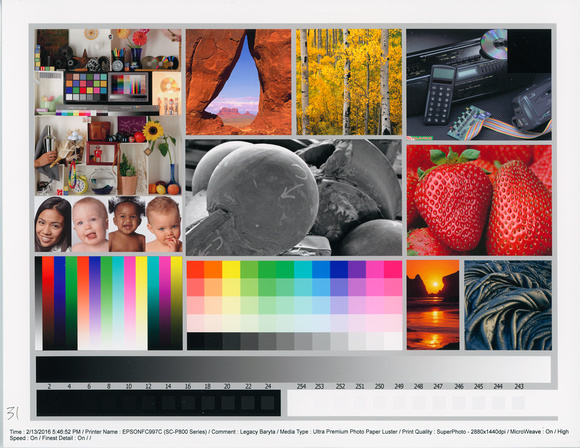 The ICC profile that Red River created for the Epson SureColor P800 (here) is almost a clone to Epson's profile for the Epson Legacy Baryta. While comparing both the Epson and Red River under my GTI light box, my only observation was that the Epson profile was slightly better in the reds and for ABW was slightly better in the lightest grays which means softer highlights. It was subtle, but something only a trained eye under a light box will notice as this paper and profile is simply phenomenal. To get an ICC profile for your printer, visit here. My wife doesn't give one <expletive> about big prints - she wants 4x6 and that's it. However, it frustrates me that most 4x6 papers are mediocre at best, so I keep trying to do a larger print (because I'm too lazy to cut and too cheap to waste bigger paper <g>). She turns her nose up at it and ask me to print again, so for a while now I've just settled on the fact that if she's happy then it doesn't matter if the print is mediocre. 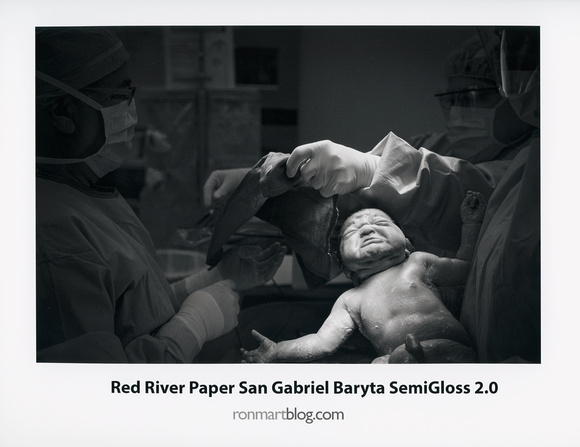 Goodbye mediocracy, because unlike other brands Red River makes a 4x6 version of San Gabriel Baryta Semi Gloss 2.0, so my wife can have her favorite print size and I can get the maximum quality of out of the print. I can't emphasis how excited I am about this because for about 43 cents US (as of the time this was written) I can print a 4x6 print on a true fine art paper! This is truly an exceptional paper at a bargain price. I'd have no issues using it for clients, an exhibit or a physical portfolio. While I tested it on a Epson P800, I'll definitely use it on my Canon PRO-1000 and PRO-2000 printers.